When you scrub bathroom surfaces, both the germy bacteria and the cleaning chemicals can spray onto toothbrushes, the soap dispenser and hand towels. So first, move all those items away from the general area. Then you’re ready to get right to it. 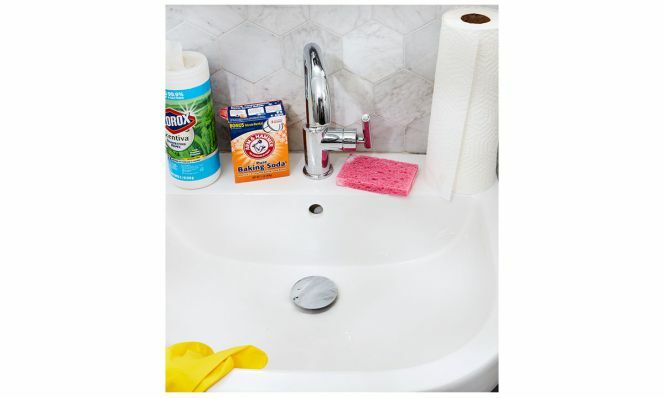 If you have a porcelain or stainless steel sink, use an all-purpose cleaner like the new Mr. Clean Clean Freak Deep Cleaning Mist (mrclean.com, $5) and a cloth or paper towel for a quick wipe-down of the basin. You’ll need elbow grease and baking soda: Dampen the sink, sprinkle baking soda all over to form a paste, and rub with a cloth or sponge until all the gunk is gone. Rinse the basin, then wipe it with a clean, dry cloth to reveal your shiny surface. Combine 1/2 cup powdered borax with the juice from half a lemon to form a paste. Rub this mixture on any stains. As if you’re not reminded every time you use the sink, the drain can be a shudder-inducing bacteria and debris catcher. When it clogs, here’s the plan of attack. Flush out the nasty with a commercial drain cleaner, or try pouring 1/2 cup white vinegar or baking soda down the drain, followed by very hot water. Another option is Lemi Shine Appliance Cleaner (amazon.com, $7 for 3 packets), which works using citric acid and baking soda instead of harsh chemicals. Empty the pouch down the drain, then trickle hot water into it for about two minutes. If neither of these solutions works, it’s time for a drain snake to come face-to-face with the hairy beast that’s likely lurking below. Your kids use the toilet, wipe, flush...then turn on the faucet. So you want to disinfect those handles as often as possible (and the toilet handle too). Clorox Disinfecting Wipes (target.com, $5) make this task so easy that even a teenager can do it. To get the debris out of the tiny crevices at the base of the handles and faucet, grab a piece of dental floss and go to town. Actually not the toilet but the toothbrush holder. Clean it once a week, and we mean it. If it’s a cup that sits on your sink, toss it in the dishwasher and call it a day. 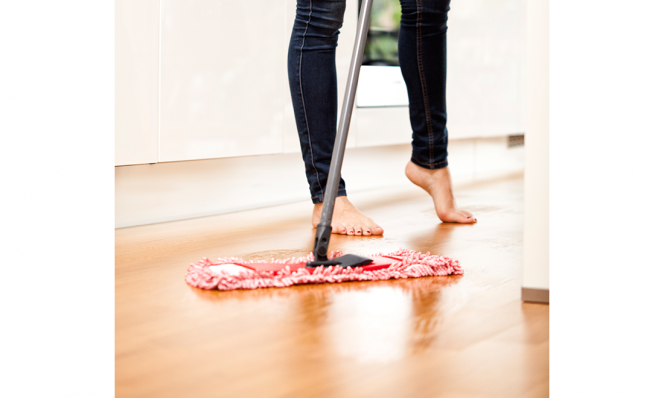 If it’s attached to the wall or mirror, use a microfiber cloth with dish soap and hot (germ-killing!) water. Keep the disinfecting wipes within view and reach of the sink so that everyone can easily clean up after themselves—no excuses. Entice the budding scientist in your home to pour the cleaning mixture down the drain and hear it sizzle.